A blood test during pregnancy could one day replace more invasive tests for Down's syndrome, say researchers. High-risk women are currently offered an amniocentesis test, which carries a risk of miscarriage. But Dutch researchers told a fertility conference they are on the verge of developing an accurate way of testing the mother's blood for chromosome disorders in the foetus. Experts said it was promising but early days. The test is based on a series of "probes" that attach to specific points on a chromosome. It is the same technique that is already used to detect problems in foetal DNA in samples taken from the amniotic fluid in the womb. 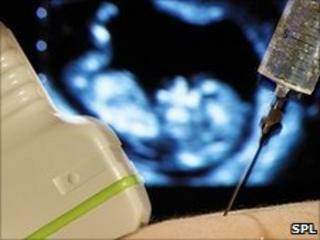 But the advantage of testing the mother's blood is that it is non-invasive, quick and carries no risks for the foetus. Delegates at the European Society of Human Reproduction and Embryology heard that the team have so far successfully identified the male or Y chromosome from the foetus in the mother's blood, proving their technique works. It can be used as early as six-to-eight weeks, they said. They are now using the same principle to develop probes to detect the extra chromosome found in Down's syndrome. It will be tested in women at high risk of an abnormal pregnancy and so already undergoing prenatal screening and invasive tests. But if proven to be accurate, the researchers hope that all women will have access to the blood test within a few years. Study leader Dr Suzanna Frints, a clinical geneticist at Maastricht University Hospital, says the costs of such tests are coming down all the time and it could eventually be available for as little as £25. "Blood samples can be taken during routine antenatal visits." "It is inexpensive compared to the costs of invasive prenatal diagnosis, and could easily be implemented at low cost. She added: "At the moment, the reliability of the test is about 80% due to false negative results, but we are working to improve the accuracy." Professor Stephen Robson, spokesman for the Royal College of Obstetricians and Gynaecologists, said there are a number of labs around the world working on different techniques for such diagnostic tests. "It is the holy grail of prenatal diagnosis to try and find a reliable method of diagnosing Down's syndrome and other chromosome abnormalities without doing invasive testing. "This is another technique that could offer the potential to diagnose Down's syndrome non-invasively but it's important to emphasise that it is some years away."